Lynn wanted a midcentury home, but her destiny was a new build. She still wanted a Mamie pink bathroom — so she made one of her own from scratch — with sassy pink poodles as her muse. And: I think her design idea for making use of precious wallpaper fragments is genius! 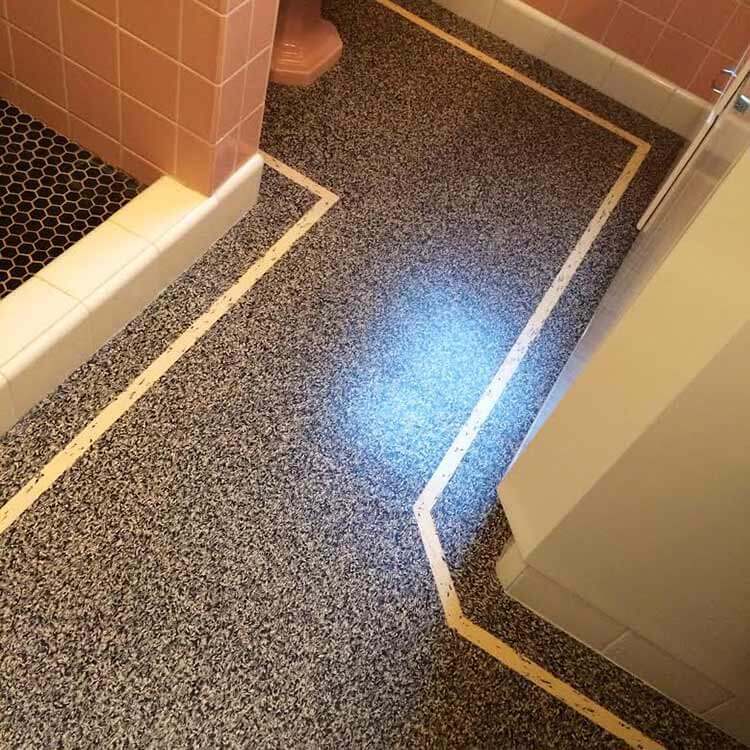 I would love to let you show my bathroom. I have been following you for 5 or 6 years. And you inspired me to midcenturyize our new-build home. I got so much help from your blog; I don’t think I could have done it without you! 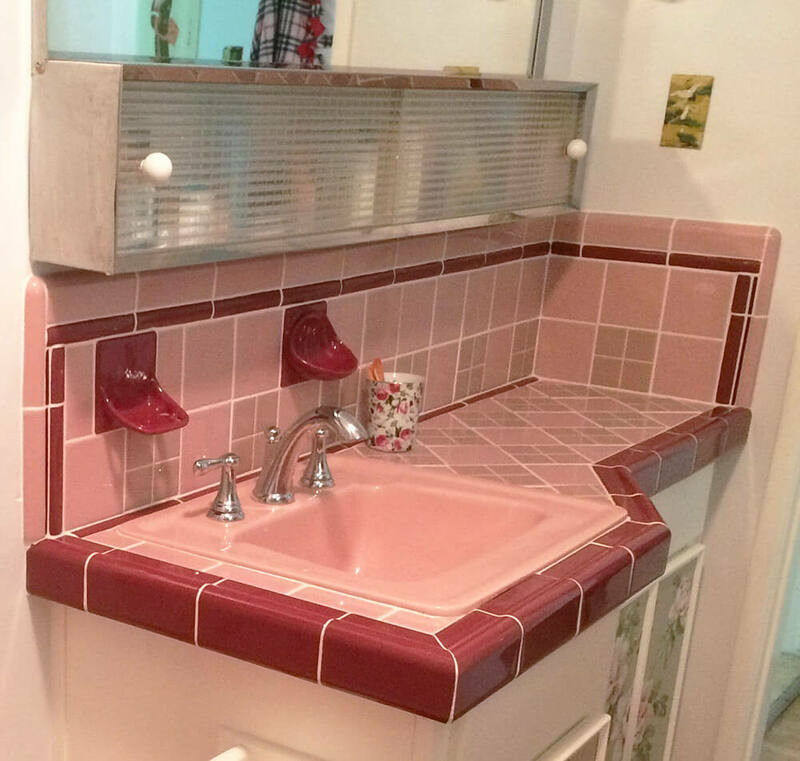 I wanted a mid century home but we ended up buying a new build that looks like a turn of the century Florida home. I did not want to give up my mid century furniture so we decided it could be an old home in the 60’s that would have been updated over time. I used your website to find tile, cabinet hardware, lighting, pink toilet and sink, and so many 0ther things. I spent months online looking for sources and ordering things. 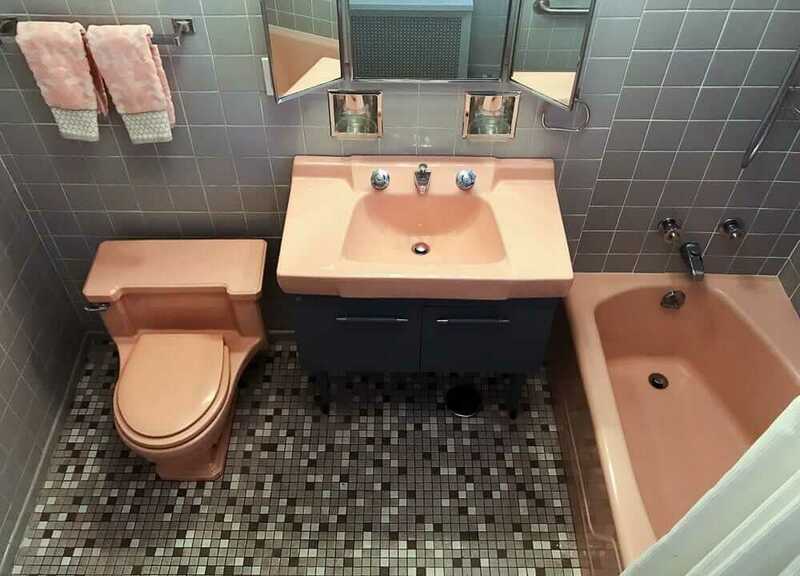 As a result, I have my pink poodle half bath and a blue Big Chill kitchen. Some rooms are a work in progress. Next I need to get rid of much of the off white paint and add more mid century color. I forgot about the wall paper panels. I found the vintage poodle paper but there was not enough to do anything with 10-ft. high ceilings, so I put it in panels on each wall. 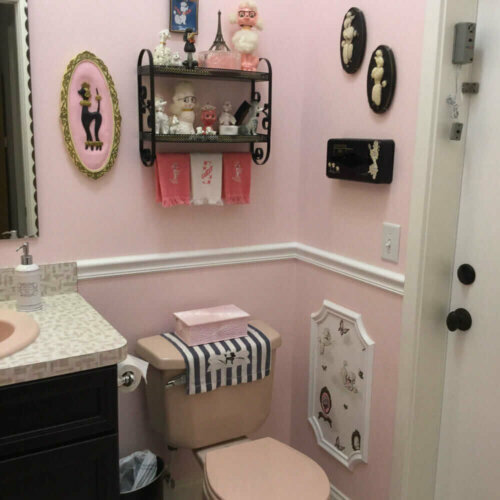 Thank you for your interest in my pink bathroom. It is a very happy room! Thank you, Lynn! This makes me so very happy! 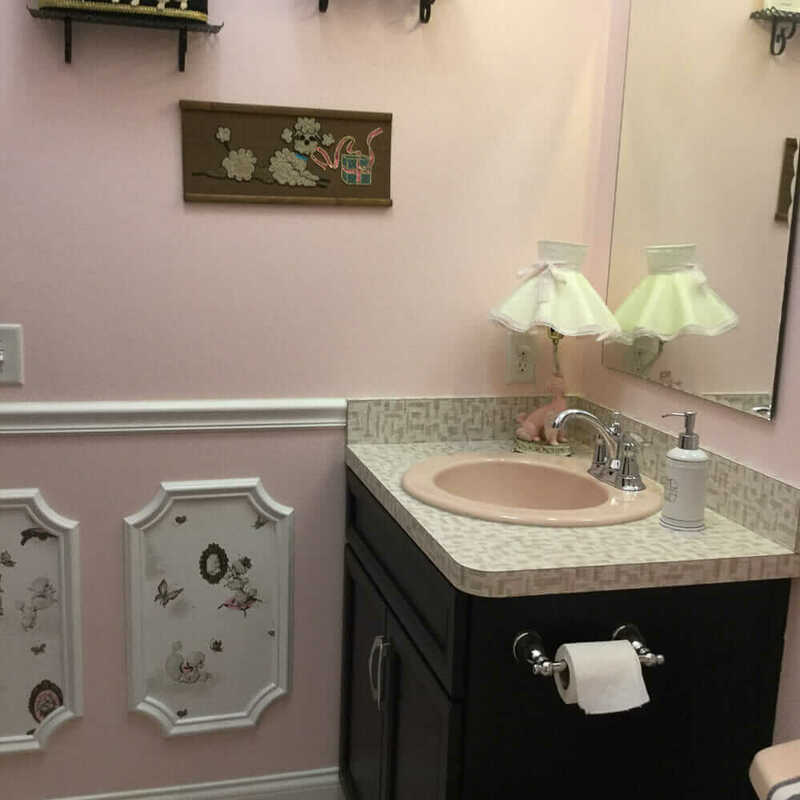 We are in the process of making our basement a tiki lounge and the bathroom will be Mamie Eisenhour pink, complete with poodles and a framed photo of Mamie, herself! 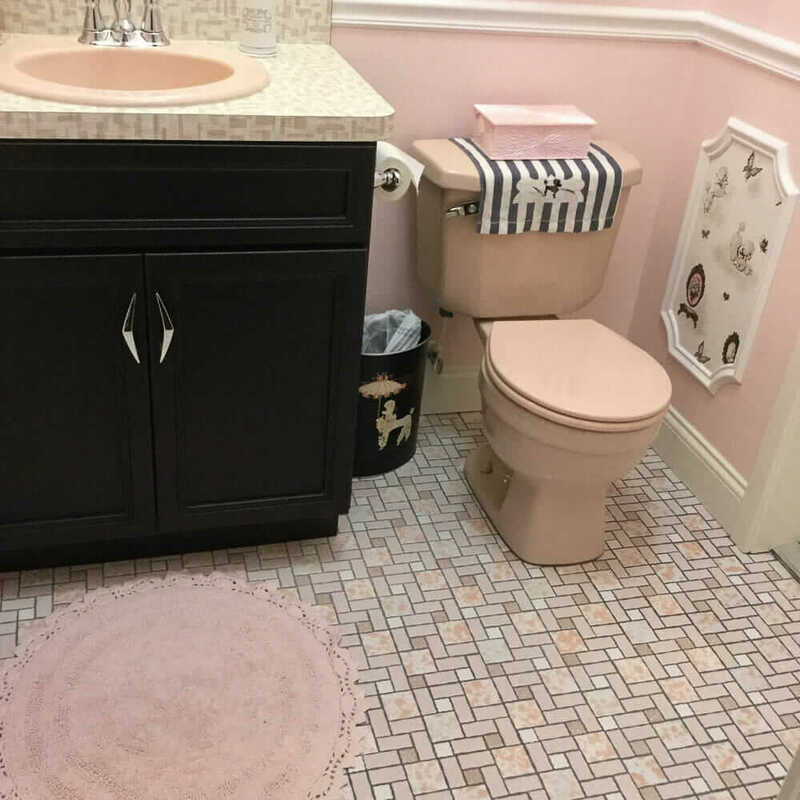 Love her bathroom and fantastic use of vintage wallpaper! The Poodle wallpaper panels are ingenious!! Excellent use and showcase of a limited product! Hope you end up showing us the rest of your home as you progress throughout it.